This freeware utility virtually connects any GPS receiver with your digital camera. It automatically geotags your photos based on the track data from GPS exchange files. Select the GPS exchange file (.gpx format). It may be necessary to create this file using the Export function in your GPS software (e.g. Garmin MapSource). The auto-geotagging leaves any photo metadata such as EXIF, IPTC, Makernote, completely intact. Picmeta PhotoTracker can tag many file formats including RAW. It can write the coordinates directly into RAW files, but you can also choose to create XMP sidecar files instead. The sidecar file format is Adobe standard which is supported by many, but not all applications. 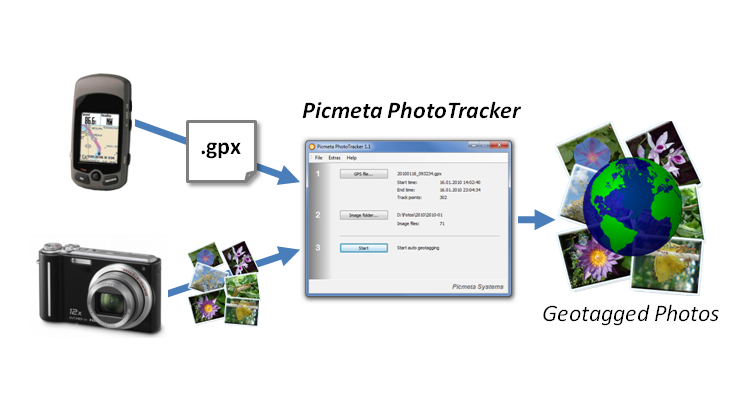 Picmeta PhotoTracker is freeware. It is fully functional without any limitations.